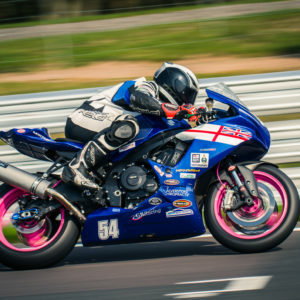 August bank holiday weekend and the team were set for round 7 of the ThundersportGB calendar. 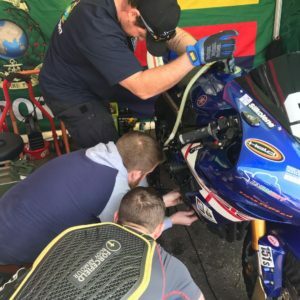 Not letting the bank holiday traffic delay and hold us back too much the team were set up for testing at the Anglesey circuit on Saturday enabling us to get the best out of our machines ready for racing on the Sunday and Monday. 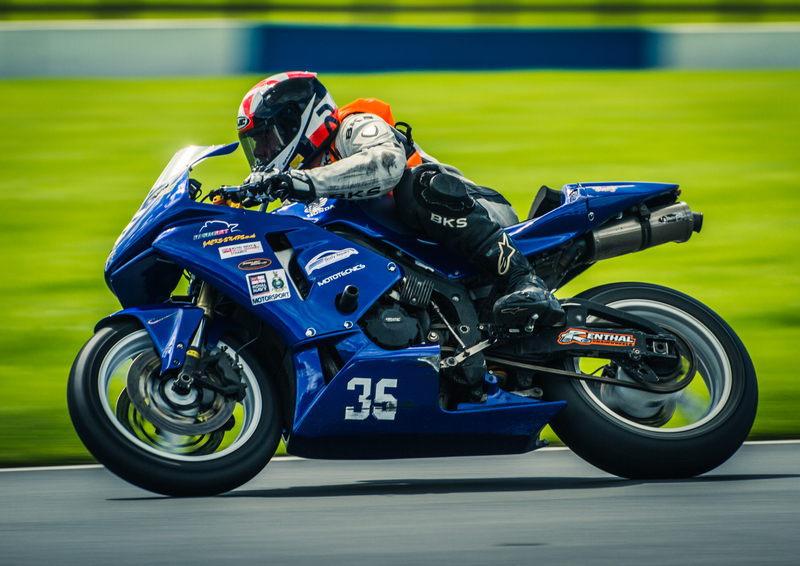 For me this was the second time I had been to this venue in North Wales, the first being when I first started out my interest in motorcycle racing with the Grassroots track day arranged by members of the RNRMRRT in 2016. The track day was held on the international GP layout which almost caught me out on the first lap of testing when I considered accelerating towards a straight that was coned off after peel corner but as we were using the coastal circuit layout I needed to quickly throw the bike over for the corkscrew leading back onto the start/finish straight. Team captain Brian Fuidge had a bad start to his weekend with a cracked engine casing on his 600cc machine. Lucky to have one of the sponsors ‘Sparklight Racing’ on side they let him borrow one of their spare bikes to enable him to still race that weekend even if it was in a different class. With the bikes all in one piece at the end of the day the team all got through scrutineering (safety check of bikes and kit) with no dramas. Sunday morning started with the 15 minutes of qualifying session, I was looking for good lap times but got stuck behind a slower rider I was finding difficult to pass so didn’t get the results I wanted. In hind sight I should have slowed to create a gap and then go onto set a quicker time but I’m still a novice in my first season so maybe next time I will think of that. Due to the slow qualifying I ended up in the 600 cup races which were placed at the back of the grid of the golden era class. Golden era being bikes with more age in them but did not mean they were much slower. The team presence in this was now 4 riders strong with me, Dave “Tinkerbell”, Max and Al “Sponge Bob” mixing in with riders from all different teams. This left Bri in the Super Twin class and Cemal Oram in the pre national 600 class. I didn’t let qualifying or being near the back of the grid deter me as I knew that I had a chance to come top in the 600 cup class. I had a great start and consistent race first time out and wasn’t sure what the result was. When I got to Parc Ferme at the end of the race. Bri was there waiting and told me that I was on the podium, my name called out as winner of the 600 cup was great picking up the first trophy of the weekend. Race 2 followed after lunch and I repeated my success to get another first place finish in the 600 cup race. Two trophies for the team. Monday was a bit delayed with many red flagged races (races being stopped) due to some large crashes which luckily wasn’t any of the RN/RM team. I knew my lap times had improved all day Sunday and Monday morning I moved back into my original class the pre national 600. This time I was right at the back (40th position) for the start of both races on Monday but with the confidence from the day before I was keen to do the best I could. 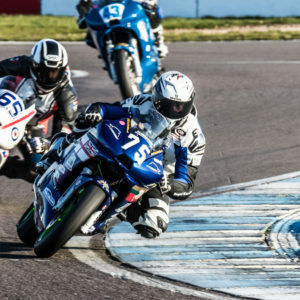 40 bikes on one grid is I tight squeeze into some of the tight corner after the back straight and this saw my first race on the Monday red flagged as riders went down in front of me and leaving debris on track. The race restarted and now further incidences accrued in following races other that close battles shoulder to shoulder up the back straight. Good luck to the team as we go onto the next round set at Oulton park in September.